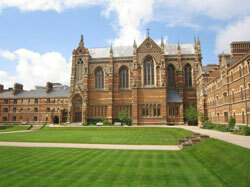 Oxford – A great place for studying and shopping! I always wanted to visit this famous University town and last month I was finally able to go there. Like we all do, the first thing I did when arriving in Oxford was to drop my luggage at the hotel. I stayed at the Randolph, which was an experience on its own because of its neo-Gothic style. The detective fans among us might know that this hotel is famous for the inspector Morse scenes that have been filmed in the hotels’ bar. The bar with the very original name 😉 ‘Morse bar’, is often visited by tourists to have a drink or just take some photos and then leave again. I knew that Oxford is known for its University and colleges, but it was a positive surprise that it is also very good for shopping too! You can find many high street shops and department stores, but for a different shopping trip you should definitely visit the covered market, with many specialist shops, food markets, some hairdressers and small vintage boutiques. It was noteworthy that there were a lot of tourists and international students in the shopping areas. It wasn’t comparable to London’s Oxford Street, but the shopping streets of Oxford itself are certainly popular among tourists as well.